We live in a world with other living beings that are adapting to a changing environmental stresses. There has been much interest in ‘junk DNA’, non-coding areas of our DNA are far from being without function. DNA has two basic categories of nitrogenous bases: the purines (adenine [A] and guanine [G]), and the pyrimidines (cytosine [C], thymine [T], and no uracil [U]), while RNA contains only A, G, C, and U (no T). The Watson-Crick proposal set the path of molecular biology for decades into the 21st century, culminating in the Human Genome Project. Neverthess, there were unrelated discoveries that took on huge importance. For example, since the 1920s, the work of Warburg and Meyerhoff, followed by that of Krebs, Kaplan, Chance, and others built a solid foundation in the knowledge of enzymes, coenzymes, adenine and pyridine nucleotides, and metabolic pathways, not to mention the importance of Fe3+, Cu2+, Zn2+, and other metal cofactors. Of huge importance was the work of Jacob, Monod and Changeux, and the effects of cooperativity in allosteric systems and of repulsion in tertiary structure of proteins related to hydrophobic and hydrophilic interactions, which involves the effect of one ligand on the binding or catalysis of another, demonstrated by the end-product inhibition of the enzyme, L-threonine deaminase (Changeux 1961), L-isoleucine, which differs sterically from the reactant, L-threonine whereby the former could inhibit the enzyme without competing with the latter. The current view based on a variety of measurements (e.g., NMR, FRET, and single molecule studies) is a ‘‘dynamic’’ proposal by Cooper and Dryden (1984) that the distribution around the average structure changes in allostery affects the subsequent (binding) affinity at a distant site. What else do we have to consider? The measurement of free radicals has increased awareness of radical-induced impairment of the oxidative/antioxidative balance, essential for an understanding of disease progression. Metal-mediated formation of free radicals causes various modifications to DNA bases, enhanced lipid peroxidation, and altered calcium and sulfhydryl homeostasis. Lipid peroxides, formed by the attack of radicals on polyunsaturated fatty acid residues of phospholipids, can further react with redox metals finally producing mutagenic and carcinogenic malondialdehyde, 4-hydroxynonenal and other exocyclic DNA adducts (etheno and/or propano adducts). The unifying factor in determining toxicity and carcinogenicity for all these metals is the generation of reactive oxygen and nitrogen species. Various studies have confirmed that metals activate signaling pathways and the carcinogenic effect of metals has been related to activation of mainly redox sensitive transcription factors, involving NF-kappaB, AP-1 and p53. There is heterogeneity among cancer cells of expected identical type, which would be consistent with differences in phenotypic expression, aligned with epigenetics. There is also heterogeneity in the immediate interstices between cancer cells. Integration with genome-wide profiling data identified losses of specific genes on 4p14 and 5q13 that were enriched in grade 3 tumors with high microenvironmental diversity that also substratified patients into poor prognostic groups. In the case of breast cancer, there is interaction with estrogen , and we refer to an androgen-unresponsive prostate cancer. Finally, the interaction between enzyme and substrates may be conditionally unidirectional in defining the activity within the cell. The activity of the cell is dynamically interacting and at high rates of activity. In a study of the pyruvate kinase (PK) reaction the catalytic activity of the PK reaction was reversed to the thermodynamically unfavorable direction in a muscle preparation by a specific inhibitor. Experiments found that in there were differences in the active form of pyruvate kinase that were clearly related to the environmental condition of the assay – glycolitic or glyconeogenic. The conformational changes indicated by differential regulatory response were used to present a dynamic conformational model functioning at the active site of the enzyme. In the model, the interaction of the enzyme active site with its substrates is described concluding that induced increase in the vibrational energy levels of the active site decreases the energetic barrier for substrate induced changes at the site. Another example is the inhibition of H4 lactate dehydrogenase, but not the M4, by high concentrations of pyruvate. An investigation of the inhibition revealed that a covalent bond was formed between the nicotinamide ring of the NAD+ and the enol form of pyruvate. The isoenzymes of isocitrate dehydrogenase, IDH1 and IDH2 mutations occur in gliomas and in acute myeloid leukemias with normal karyotype. IDH1 and IDH2 mutations are remarkably specific to codons that encode conserved functionally important arginines in the active site of each enzyme. In this case, there is steric hindrance by Asp279 where the isocitrate substrate normally forms hydrogen bonds with Ser94. Personalized medicine has been largely viewed from a lens of genomics. But genomics is only the reading frame. The living activities of cell processes are dynamic and occur at rapid rates. We have to keep in mind that personalized in reference to genotype is not complete without reconciliation of phenotype, which is the reference to expressed differences in outcomes. There has been a causal link between alterations in cellular metabolism and the cancer phenotype. Reorganization of cellular metabolism, marked by a shift from oxidative phosphorylation to aerobic glycolysis for cellular energy requirements (Warburg effect), is considered a hallmark of the transformed cell. In addition, if tumors are to survive and grow, cancer cells need to adapt to environments high in metabolic stress and to avoid programmed cell death (apoptosis). Recently, a link between cancer growth and metabolism has been supported by the discovery that the LKB1/AMPK signaling pathway as a tumor suppressor axis. The Liver Kinase B1 (LKB1)/AMPK AMP-activated protein kinase/mammalian Target of Rapamycin Complex 1 (mTORC1) signaling pathway links cellular metabolism and energy status to pathways involved in cell growth, proliferation, adaption to energy stress, and autophagy. LKB1 is a master control for 14 other kinases including AMPK, a serine-threonine kinase which senses cellular AMP/ATP ratios. In response to cellular starvation, AMPK is allosterically activated by AMP, leading to activation of ATP-generating pathways like fatty acid oxidation and blocking anabolic pathways, like lipid and cholesterol synthesis (which consume ATP). In addition, AMPK regulates cell growth, proliferation, and autophagy by regulating the mTOR pathway. AMPK activates the tuberous sclerosis complex 1/2, which ultimately inhibits mTORC1 activity and inhibits protein translation. This mTOR activity is dis-regulated in many cancers. In a recent Cell Metabolism paper, Brandon Faubert and colleagues describe how AMPK activity reduces aerobic glycolysis and tumor proliferation while loss of AMPK activity promotes tumor proliferation by shifting cells to aerobic glycolysis and increasing anabolic pathways in a HIF1-dependent manner. 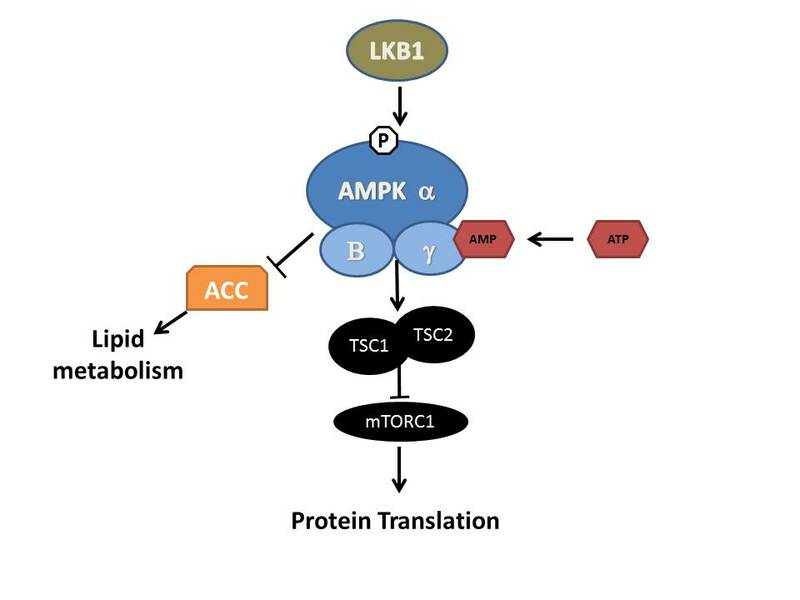 AMPK is a metabolic sensor that helps maintain cellular energy homeostasis. Despite evidence linking AMPK with tumor suppressor functions, the role of AMPK in tumorigenesis and tumor metabolism is unknown. Here we show that AMPK negatively regulates aerobic glycolysis (the Warburg effect) in cancer cells and suppresses tumor growth in vivo. Genetic ablation of the α1 catalytic subunit of AMPK accelerates Myc-induced lymphomagenesis. Inactivation of AMPKα in both transformed and nontransformed cells promotes a metabolic shift to aerobic glycolysis, increased allocation of glucose carbon into lipids, and biomass accumulation. These metabolic effects require normoxic stabilization of the hypoxia-inducible factor-1α (HIF-1α), as silencing HIF-1α reverses the shift to aerobic glycolysis and the biosynthetic and proliferative advantages conferred by reduced AMPKα signaling. Together our findings suggest that AMPK activity opposes tumor development and that its loss fosters tumor progression in part by regulating cellular metabolic pathways that support cell growth and proliferation. Below is the graphical abstract of this paper. However, this regulation of tumor promotion by AMPK may be more complicated and dependent on the cellular environment. Nissam Hay from the University of Illinois College of Medicine, Chicago, Illinois, USA and his co-workers Sang-Min Jeon and Navdeep Chandel were investigating the mechanism through which LKB1/AMPK regulate the balance between cancer cell growth and apoptosis under energy stress. In their system, the loss of function of either of these proteins makes cells more sensitive to apoptosis in low glucose environments, and cells deficient in either AMPK or LKB1 were shown to be resistant to oncogenic transformation. Whereas previous studies showed (as above) AMPK opposes tumor proliferation in a HIF1-dependent manner, their results showed AMPK could promote tumor cell survival during periods of low glucose or altered redox status. The researchers incubated LKB1-deficient cancer cells in the presence of either glucose or one of the non-metabolizable glucose analogues 2-deoxyglucose (2DG) and 5-thioglucose (5TG), and found that 2DG, but not 5TG, induced the activation of AMPK and protected the cells from apoptosis, even in cells that were deficient in LKB1. The authors demonstrated that glucose deprivation depleted NADPH levels, increased H2O2 levels and increased cell death, and that this was accelerated in cells deficient in the enzyme glucose-6-phosphate dehydrogenase. Anti-oxidants were also found to inhibit cell death in cells deficient in either AMPK or LKB1. Knockdown or knockout of either LKB1 or AMPK in cancer cells significantly increased levels of H2O2 but not of peroxide (O2–) during glucose depletion. The glucose analogue 2DG was able to activate AMPK and maintain high levels of NADPH and low levels of H2O2 in these cells. The nucleotide coenzyme NADPH is generated in the pentose phosphate pathway and mitochondrial metabolism, and consumed in H2O2 elimination and fatty acid synthesis. If glucose is limited mitochondrial metabolism becomes the major source of NADPH, supported by fatty acid oxidation. AMPK is known to be a regulator of fatty acid metabolism through inhibition of two acetyl-CoA carboxylases, ACC1 and ACC2. Short interfering RNAs (siRNAs) to knock down levels of both ACC1 and ACC2 in A549 cancer cells and found that only ACC2 knockdown significantly increased peroxide accumulation and apoptosis, while over-expression of mutant ACC1 and ACC2 in LKB1-proficient cells increased H2O2 and apoptosis. Therefore, it was concluded AMPK acts to promote early tumor growth and prevent apoptosis in conditions of energy stress through inhibiting acetyl-CoA carboxylase activity, thus maintaining NADPH levels and preventing the build-up of peroxide in glucose-deficient conditions. Could AMPK regulation be different in cancer stem cells vs. non-stem cell? 1. Green AS, Chapuis N, Lacombe C, Mayeux P, Bouscary D, Tamburini J: LKB1/AMPK/mTOR signaling pathway in hematological malignancies: from metabolism to cancer cell biology. Cell Cycle 2011, 10(13):2115-2120. 2. Faubert B, Boily G, Izreig S, Griss T, Samborska B, Dong Z, Dupuy F, Chambers C, Fuerth BJ, Viollet B et al: AMPK is a negative regulator of the Warburg effect and suppresses tumor growth in vivo. Cell metabolism 2013, 17(1):113-124. 3. Jeon SM, Chandel NS, Hay N: AMPK regulates NADPH homeostasis to promote tumour cell survival during energy stress. Nature 2012, 485(7400):661-665. The population-shift mechanism allows for the re-engineering of biosensors utilizing the concept of allosterism to allow for a structure-based switching on/off capacity into biosensors, “smart-biomaterials, and other artificial biotechnologies. A fundamental problem in the design of valuable biosensors has been limited number of biomolecules that produce enough signal (for example emission of light, etc.) upon binding to its target. However this issue has been resolved with the development of biosensors in which target binding is transduced into a quantifiable optical or electrochemical signal after coupling with conformational changes in the receptor (for review see (2)). Binding of the receptors is dependent on an unfavorable conformational change, so there is possibility to fine tune this conformational switch. NAD+ -dependent dehydrogenases. For example, the binding of O2 to hemoglobin is enhanced the binding of addition O2, the Bohr effect (the affinity of hemoglobin to O2 depends on H+), and the metabolic product diphosphoglycerate regulates O2 binding. DNA-based biosensors rely on the hybridization of complementary DNA. Many optical biosensors based on the phenomenon of surface plasmon resonance (SPR) utilize a property of and other materials; specifically that a thin layer of gold on a high refractive index glass surface can absorb laser light, producing electron waves (surface plasmons) on the gold surface. This occurs only at a specific angle and wavelength of incident light and is highly dependent on the surface of the gold, such that binding of a target analyte to a receptor on the gold surface produces a measurable signal. Electrochemical biosensors are normally based on enzymatic catalysis of a reaction that produces or consumes electrons (such enzymes are rightly called redox enzymes). The sensor substrate usually contains three electrodes; a reference electrode, a working electrode and a counter electrode. The target analyte is involved in the reaction that takes place on the active electrode surface, and the reaction may cause either electron transfer across the double layer (producing a current) or can contribute to the double layer potential (producing a voltage). We can either measure the current (rate of flow of electrons is now proportional to the analyte concentration) at a fixed potential or the potential can be measured at zero current (this gives a logarithmic response). The label-free and direct electrical detection of small peptides and proteins is possible by their intrinsic charges using bio-functional ion-sensitive field-effect transistors. Piezoelectric sensors utilize crystals which undergo an elastic deformation when an electrical potential is applied to them. An alternating potential produces a standing wave in the crystal at a characteristic frequency. This frequency is highly dependent on the elastic properties of the crystal, such that if a crystal is coated with a biological recognition element the binding of a (large) target analyte to a receptor will produce a change in the resonance frequency, which gives a binding signal. In a mode that uses surface acoustic waves (SAW), the sensitivity is greatly increased. Loop: This is the 18–30 base pair region of the molecular beacon which is complementary to the target sequence. Stem: The beacon stem is formed by the attachment, to both termini of the loop, of two short (5 to 7 nucleotide residues) oligonucleotides that are complementary to each other. 5′ fluorophore: At the 5′ end of the molecular beacon, a fluorescent dye is covalently attached. 3′ quencher (non fluorescent): The quencher dye is covalently attached to the 3′ end of the molecular beacon. 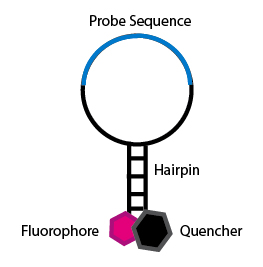 When the beacon is in closed loop shape, the quencher resides in proximity to the fluorophore, which results in quenching the fluorescent emission of the latter. Structure of a molecular beacon. Description and figure from Wikipedia (5). Common applications of DNA biosensors include cDNA microarray and Affymetrix GeneChip™ technology. Ricci et al. provide a proof-of –principle paper to demonstrate how allosteric switching can be introduced into biosensors(1). The authors engineered allosteric inhibition into a molecular beacon by the addition of two single-stranded tails that serve as an allosteric site where binding of an inhibitor sequence would bridge the two tails and prevent target binding (holding the probe in the inactivated state). Using this approach the authors demonstrated over a three-fold increase in the dynamic range of the beacon. The authors also demonstrated this effect, with an allosterically activated biosensor in which “allosteric activation was engineered into a molecular beacon using one single-stranded tail as an allosteric binding site. The activator sequence binding to this tail partially invades the stem, destabilizing the nonbinding state and thus improving the target affinity.” Thus this population-shift mechanism allows for the design of sensors that can be allosterically activated using activators that destabilize the beacon’s nonbinding conformation, increasing the beacon’s dynamic range without compromising target specificity. Finally the authors suggest that population-shift mechanisms can be engineered into many different types of “switching” biosensors including aptamer-based and protein-based sensors (3,4).